This workshop is a good way to introduce yourself to the concepts and feel of natural materials. We will learn about cob and straw-bale building techniques through constructing a section of garden wall. You should leave with the confidence to build your own small-scale project, like a bench, garden wall, or pizza oven. Just like our intensives, this workshop will be very hands-on. On Saturday, we will begin by mixing cob and applying it on top of a stone foundation. By the end of the day, we will have installed more layers of cob, and straw-bales, too. We will end our first day with an “introduction to natural building” slideshow presentation, shortly after dinner. 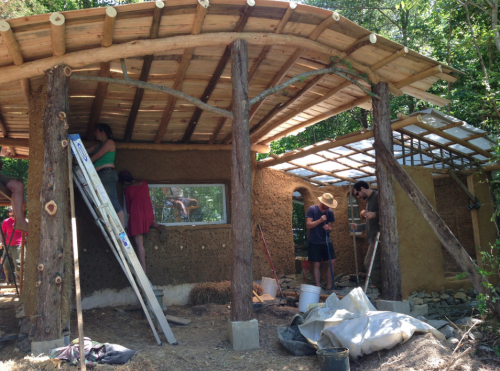 On day two, the focus will be finishing the cob on top of the wall, integrating some roof framing, and plastering over the straw-bales with natural clay plasters. If time allows, we will enjoy the experience of learning to stack stone for foundations. We will also tour the buildings at our school (including our permitted strawbale home), sometime on Saturday, and discuss each in detail.